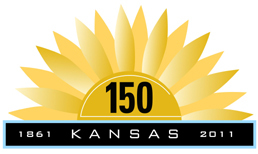 As part of Kansas's sesquicentennial state commemoration in 2011 (August 18-September 15), then Governor Sam Brownback (in office 2011-2018) held five events to announce the names of the top 25 notable Kansans selected by the governor's blue ribbon panel for history. Individual events invited the public to attend, featuring comments by Governor Brownback, special guests and receptions. Events were held at a variety of historical sites and museums across the state. Kansas Memory features over 3500 images of other Notable Kansans.